Garrett maintains shiny.rstudio.com, the development center for the Shiny R package, and is the author of Hands-On Programming with R as well as R for Data Science, a forthcoming book by O'Reilly Media (watch him write it at http://r4ds.had.co.nz/). 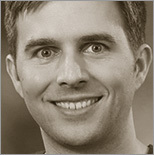 Garrett is a Data Scientist and Professional Educator at RStudio, Inc. In his own words: I specialize in teaching people how to use R - and especially Hadley Wickham's R packages - to do insightful, reliable data science. Hadley was my dissertation advisor at Rice University, where I gained a first-hand understanding of his R libraries. While at Rice, I taught (and helped developed) the courses "Statistics 405: Introduction to Data Analysis," and "Visualization in R with ggplot2". Before that, I taught introductory statistics as a Teaching Fellow at Harvard University. I'm very passionate about helping people analyze data better. I have travelled as far as New Zealand, where R was born, to learn new ways to teach data science. I worked alongside some of the original developers of R to hone my programming skills, and I collaborated with the New Zealand government in a nationwide project to improve how New Zealand teaches data analysis to new statisticians. Back in the states, I focused my doctoral research on developing pragmatic principles that guide data science. These principles create a foundation for learning R, which is a bit of a layer cake. R is a set of tools for implementing statistical methods, and statistical methods are themselves a set of tools for learning from data. Like all toolkits, R gives its best results to those who use it wisely. Outside of teaching, I have spent time doing clinical trials research, legal research, and financial analysis. I also develop R software. I co-authored the `lubridate` R package, which provides methods to parse, manipulate, and do arithmetic with date-times, and I wrote the `ggsubplot` package, which extends `ggplot2`. I'm also the Editor-in-chief of RStudio's Shiny Development Center (shiny.rstudio.com), the official resource for learning to use the shiny package to make interactive web apps with R.
The R Markdown package makes it very easy to generate reports straight from your R code. This webcast will cover applying the same report to multiple data sets.